These handmade silk scarves for women are like the canvas of a woman’s life filled with a riot of colors, which are meant to reflect the inherent personality of the wearer. 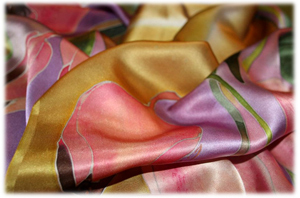 There are eight primary colors that have been used for creating each and every painting on silk scarves. Apart from the primary colors, several secondary colors or shades of primary colors have been used to give a deeper meaning to the paintings and to make these scarves stand out. The primary colors used are based on the color psychology because colors often depict a specific human behavior or emotion. Blue: This is one of the most common and soothing colors that can be used to create any type of painting. It even renders a higher social and emotional to an abstract painting. Blue signifies different aspects of human behavior and emotion like calmness, competence, confidence, loyalty, integrity, and peace. Purple/Violet: Purple or Violet as a color signifies imagination, creativity, power, vision, containment, and spiritual awareness. Purple or Violet in itself can be quite a powerful color and hence various shades and tones of purple or violet colors have been used for creating paintings on silk scarves for women. Shades of purple or violet used vary from the Han purple to electric purple and everything in between including magenta, mauve, orchid, thistle, psychedelic purple, heliotrope, mulberry, indigo, lavender, plum, amethyst, and lilac, among others. Orange: Paintings on silk scarves for women with dashes of orange in the background, in the subject, or in the foreground brings out the fun element in human behavior. Orange color signifies fun, sensuality, warmth, passion, and security, among others. 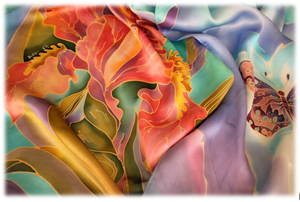 Orange is most often used in paintings that exude brightness, and when used in hand painted silk scarves, the color brings out the best in a woman’s personality!